Regius has chosen to incorporate the use of Narcotics And Explosive Detection Dogs into the services we offer for multiple reasons. Since our background is heavy in law enforcement at all levels – Federal, State and Local – we are very familiar with the use of canines. As a result, we are fully cognizant of detection dog capabilities and the benefits these services have to offer. Detection Dogs are often utilized by employers, schools, private homes, corporations, military personnel and, of course, law enforcement. The Supreme Court, and most state courts, have granted particular deference to the olfactory abilities of service dogs therefore making the value of detection dogs evident. Our dogs are certified, their training is documented and their track records are logged. This becomes very important when a case has to go to trial and a dog’s reliability will be questioned. Canine search and seizure is one of the few areas where defense lawyers have been remarkably unsuccessful in attacking the practices associated with detection dog utilization. Why do we use Narcotics Detection Dogs? For one thing, their sense of smell is almost 50 times more sensitive than a human's. A dog can sniff out drugs in situations where a human would have to search every inch of a room, vehicle, object, building, etc., which can be invasive and dangerous. Narcotics detection dogs have proven to be a sophisticated and effective means of detecting illegal drugs. As well, the entities that have incorporated their use on a regular basis, for example, schools, large employers, freight companies, have found that they are equally effective as a deterrent. In addition to sensitivity, a dog's sense of smell is particular. It can discern a specific scent even when there are dozens of other scents around. Drug smugglers have tried to fool drug-sniffing dogs by wrapping drugs in towels soaked with perfume, in coffee and a number of other mediums, however, the dogs are able to find the drugs nonetheless. 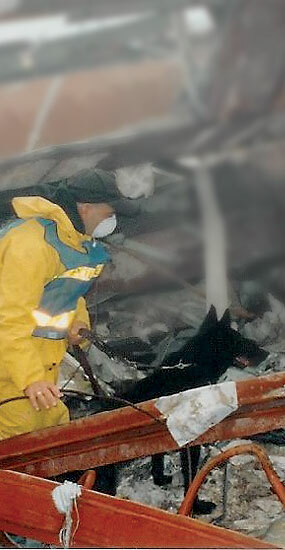 Aside from being a pro-active tool, the benefits of using a Narcotics Detection Dog include deterrence, speed in checking rooms, creating a safe and secure environment for students, teachers and employees, it limits intrusiveness and has minimal impact on daily activities, it can improve productivity, limit liability associated with workplace accidents and demonstrate commitment to the well being of employees. If you find that your organization can benefit from the services of a Narcotics Detection Canine, contact us for availability, scheduling and pricing. Why do we use Explosives Detection Dogs? For one thing, their sense of smell is almost 50 times more sensitive than a human's. A dog can detect explosive components in a situation that would be impossible for a human to locate without possibly triggering the device. Explosive detection dogs have proven to be an effective means of detecting explosive components. In addition to sensitivity, a dog's sense of smell is particular. It can discern a specific scent even when there are dozens of other scents around. Our dogs are trained to detect specific explosive components and can therefore locate explosive components in many different environments. Aside from being a deterrent, the use of a explosive detection dog can help create a safe and secure environment for students, teachers and employees, Modern day bomb threats are generally designed to disrupt business. Our dogs can assist you in demonstrating commitment to the well being of employees. If you find that your organization can benefit from the services of an Explosive Detection Canine, contact us for availability, scheduling and pricing.